Report: Al-Houthi Reveals, Who Stand in the Way of Peace in Yemen? Mohammed Ali al-Houthi,the head of the revolutionary committee in Yemen talks about the reality of what is happening politically to prevent any peace initiatives in Yemen,and reveals the facts of what happened since before the 2011 initiative, through his movement’s experience with previous peace talks, the recent reconciliation plan, and the international community’s responsibility in creating this humanitarian catastrophe. “The attack and the aggression on Yemen was not born of the moment but was prepared by previous plans” , “This was revealed by the former UN envoy, Jamal Benomar, when he delivered a message to the leader of the revolution, Sayyed. 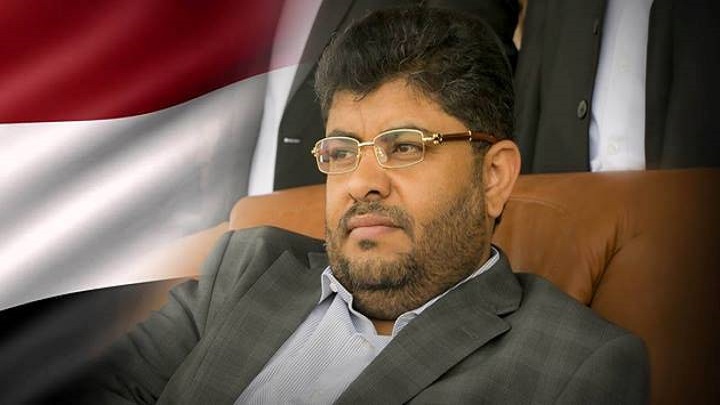 Abdulmalik Badruddin al-Houthi, which said that America and ten other countries of the Gulf Cooperation Council initiative are ready for armed intervention to confront us militarily if we did not stop the revolution against the corrupt government.” al-Houthi explains details in an interview with a journalist covers U.S. foreign policy in Yemen. First of all,”we have moved against those corrupt people by a legitimate action, a popular movement that came from the people’s concerns, aspirations and hopes, and therefore the international community must recognize that the Yemeni people have the right to self-determination.”al-Houthi said. The Gulf Cooperation Council (GCC) initiative in 2011 had set the stage for the war that continues to this day. After intense protests and months of back-and-forth negotiations, the late President Saleh finally agreed to step down. Saleh met with members of the GCC and eventually signed a transitional agreement after a series of backroom deals in Riyadh,al-Houthi tells events. The agreement left Saleh conceding power to Hadi, who was vice president at the time. Thirty days later, Hadi held a snap election specially designed by Saudi Arabia to ensure his victory. Both Ansarullah and Yemen’s Southern Movement called for election boycotts. Protests and clashes continued in various parts of the country citing corruption and high fuel prices. In September of 2014, this reached a climax when members of the Ansarullah movement — along with supporters of Saleh’s party, the General People’s Congress (GPC) — gradually took control of the capital city, Hadi resigned in 2015. After attempting to set up an improvised capital in Aden, Hadi fled for Riyadh where he currently resides,shortly after, Saudi Arabia launched its military coalition compain to reinstate Hadi. The last thing Saudi Arabia and their Western allies want is a self-sustaining, economically viable, militarily strong, and anti-imperialist Yemen at the bottom of the Arabian Peninsula, controlling the Red Sea and its strategic waterways. The importance of Yemen’s geographic placement in regards to the flow of world capital cannot be stressed enough,al-Houthi confirmed. In the context of political negotiations concerning peace in Yemen, al-Houthi spoke about the abuses that were taking place in the negotiating halls till the recent negotiations in February,alluding the same to previous talks in Switzerland and Kuwait,and offering unconscionable conditions, Ansarullah must implement them so that Ansarullah will be accused of obstructing the peace process. The one who hinders the dialogue today and who hinders peace in Yemen is the one who kills the Yemeni people, We are working for peace, and we have talked in all our speeches and movements. We have always called for dialogue, we welcome it, we are working for its success, but when there are countries like the U.S., Saudi Arabia, and the U.A.E., they insist on continuing their aggression on Yemen even if they haven’t achieved or gained anything from it besides killing thousands of our people,al-Houth added. “It is important that there be full support for the initiative of the free members of the UN Security Council and the United Nations, and there should be full adoption of it as realistic points and reinforce the solution.” al-Houthi suggested. As well as an official statement opens by pointing out that the Security Council has failed to prevent “daily massacres against citizens in Yemen” and has essentially given up their responsibility in this matter. It reiterates the SC’s legal and moral responsibility to prevent further deterioration of the humanitarian crisis. al-Houthi submits peace plan to United Nations through the six-point plan includes a concrete basis for building peace in Yemen without influence from foreign entities. The plan suggests initiating national elections for a governing body that includes all parties, granting amnesty to political prisoners, as well as launching reconstruction efforts and reparations. Although he hasn’t received an official response, al-Houthi is holding out hope for peace,said that the new UN envoy to Yemen hasn’t started official duties yet and could have a positive influence on the peace process provided he acts from a position of neutrality. What is clear is that the U.S. administration stands by criminal regimes that do not work for rights and freedoms, but rather to confiscate the rights of Yemenis and Arabs.”,al-Houthi concluded.